I visit your web site. I am thinking of migrating to Australia. Please send me information. 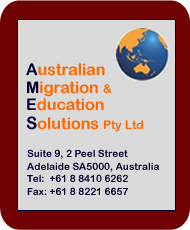 Dear sirs, I would like to contact your organisation to find out what options are available to people like me for gaining permanent residence in Australia. Hi! I understand I can settle in Australia by studying there for 2 years. Can you send me please any materials and informations about studying in Australia. Thank you. If the email you send us looks like one of those above, we won't send you a reply - because we don't believe people who send messages like these are serious about migrating to Australia! However, if you are serious about settling in Australia and if you have a genuine and precise enquiry which you would like us to answer before you send us the comprehensive details we normally request of the people who ask for our help and advice, please, go ahead and email us. But make sure that you give us enough information in your email to help us prepare a good answer. And please, give us your telephone number in the email message, so that we can contact you by phone and talk things through, if necessary. If you don't include your phone number, you should not expect to receive a reply.